﻿ El Nino gains strength, may impact monsoon. El Nino gains strength, may impact monsoon. El Nino, characterised by a warming of surface temperatures in the Pacific Ocean, is associated with lower than normal monsoon rainfall in India. The El Nino weather phenomenon is gaining strength, latest global forecasts indicate, potentially affecting the South-west (June to September). 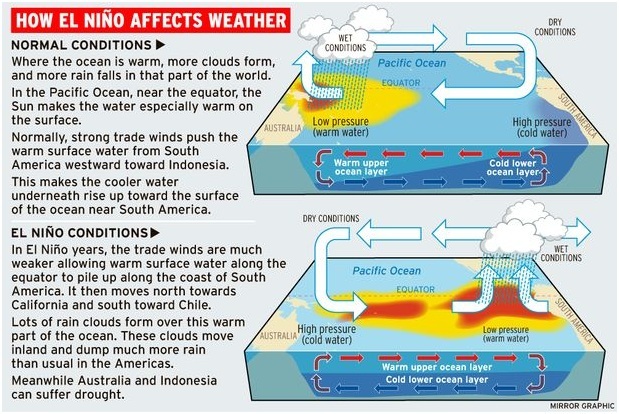 El Nino affects the flow of moisture-bearing winds from the cooler oceans towards India, negatively impact the summer monsoon, which accounts for over 70% of annual rainfall. It remains to be seen how it would actually evolve over the next few months, but if it does retain its strength after the summer, it could mar the prospects of a good monsoon in India. IMD forecast models suggest that weak El Nino conditions are likely to persist in the early part of the summer and weaken thereafter. Contrary to last year’s global forecasts indicating that El Nino would form around October 2018, its formation was confirmed in February this year. Even though it is weak at present, forecasters said El Nino has become more marked than last month. An El Niño of any strength can reduce the amount of monsoon rainfall and thus have significant local impact.